To say that the derby Saturday night is big would be the understatement of the milennium. Many people don’t understand how deep the rivalry is or just how long the feud has run. So a quick overview to maybe bring some of you up to speed: A.C. Milan was founded in 1899. In 1908, a group of people unhappy with the club’s ratio of Italians to foreigners split off and founded F.C. 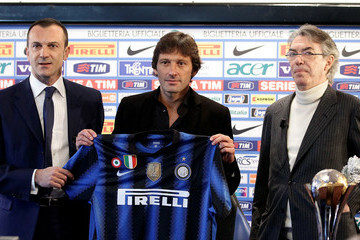 Internazionale Milano. The family feud was born. A.C. Milan was supported by the working class, Inter was supported by the upper middle class. They shared a city, and eventually a stadium, but did not in any way share the same supporters. You were either a Rossonero or Nerazzuro. Period. Fast forward to the big Calciopoli scandal of 2006. Tapes miraculously appeared implicating a number of clubs in the biggest match fixing scandal to date, including AC Milan. Originally, Milan were to have been relegated to Serie B like Juventus. Instead, they only received a 30 point deduction for the season for their alleged involvement. Massimo Moratti, Inter’s owner and president, was quick to absolve his club of any wrongdoing and point the finger at all of the other clubs. 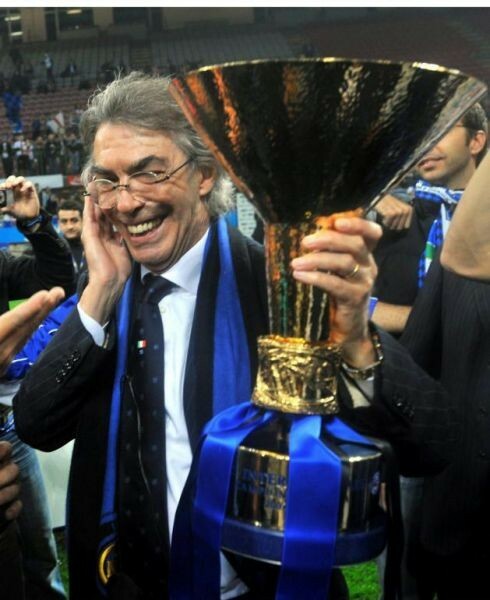 However, rumors have come forward from at least one former Inter player that Moratti was actually the mastermind of Calciopoli, the one who provided the tapes. Even better, new tapes and evidence that Inter was just as involved as everyone else has since come forward, and there is a second trial going on as we speak. Now, even if he is proven innocent, his club benefited from the scandal by having the 2006 Scudetto (stripped from Juventus) awarded to them, even though they only finished 3rd that season. They stole bought players such as Ibra from the relegated Juve and otherwise took advantage of their rivals’ punishments. No coincidence that they went on to win the next 4 Scudetti, with their biggest rivals still suffering from the scandal. So for that and so many more reasons, it is time that AC Milan take back the Scudetto. All of Serie A are rooting for Milan, or at least anyone but Inter. That those snakes are boasting about their most successful club run, which only happened because their strongest opponents were incredibly handicapped and are still recovering from scandal, makes for an increased hatred and rivalry in this century old feud. Add to that the traitorous Leonardo. After 13 years with AC Milan, he crosses the feud line to help our most hated rivals? My guess is that karma will have its way with him. And I hope it starts with this derby. Leo didn’t count on facing the brilliant Max Allegri. A wise tactician, and someone who learns from his mistakes, he has carefully and meticulously built a team out of a bunch of (albeit talented) mismatched pieces. In addition to giving the players unity and a belief in themselves and the team, he has managed to bring out the best in so many of the players this year, the same players who were benched by Leo and hung up to dry last year. As much as Ibra would have loved to play again against his old club now that Allegri has increased his passion for the game, Materazzi will have to be knocked unconscious somewhere off the pitch or by someone else. Ibra’s suspension is the talk of the derby, but it will be 11 other players that will be talked about on Sunday. Who those players will be is anyone’s guess. Pirlo is supposed to be back from injury, along with van Bommel and Boateng. Give me a Gattuso, and that is one tasty midfield. Only who knows how much these guys will be able/allowed to play? 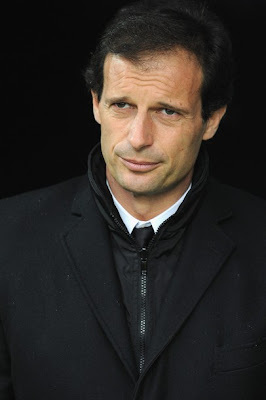 We have 7 other games after this one to consider, and Allegri doesn’t like to take chances on injuries or fitness. Pato is working overtime to be fit, and with Cassano could maybe just put a goal or two past the great Julio Cesar. With Boateng as the trequartista, maybe Robinho splits that time with him because of his recovering injury. Either way, these will be the players who need to make it happen. One goal is all it takes, if we keep the back line tight against the likes of snake eyes Pazzini, Eto’o, Pandev, and possibly Milito, recently recovered from injury. Speaking of our back line, if Nesta doesn’t start, I would go with Legrottaglie, especially with Yepes just coming off of International duty. Paired with Silva, Abate, and whomever Allegri pulls out of the hat on the left, this is our stronghold, and it will definitely be tested against such in form strikers. I do think Abate has been studying martial arts with Ibra just for this chance to meet the less-than-charming Pandev once again. And he will be wise enough now to avoid the accompanying red card. Inter’s midfield won’t be easily tamed, especially not with the unstoppable Wesley Sneijder. It will be the battle for possession and the ability for our midfield to shut down any quick counter attacks that will be so important to prevent the amazing Abbiati from being tested. Forget that we won this fixture earlier this year, we have the strong defense and an offense that has been firing blanks, they have the in form offense who have been scoring, and a defense that was weak before it lost Lucio & Ronocchia, its two best defenders. We are 2 points up on the table, but have been slipping down a little, they are coming from behind but convincingly, even if inexplicably. Given this information, it would seem that they have the advantage, even if only slightly. You see, you have to score to win, and that seems to be our struggle these days. Even if they were to concede a goal or two, if they are able to score more than they concede, that determines it. But what they may have in offense, they lack in purpose. Having taken advantage of the demise of Serie A and some of its biggest teams, they expect to win the Scudetto like entitled school children. Over the past 5 years, they surpassed us in number of Scudetti, like kicking someone when they were down, now it’s time we start righting that wrong, too. And so Milan are hungry for this title, waiting 7 years since their last one, having been punished by the scandal and working their way back to a position to win, only slipping up to finish 3rd last year, ironically at the inexperienced hands of the infamous Leo. We have worked through injuries the Nerazzurri could only have nightmares about. We have stood by our team this year through a big learning curve, and through endless media criticism and speculation. We need to win it for our Milan legends, some of whom will be anxiously watching at the San Siro this weekend. I believe that it is time to take back what is ours. It’s time that we show those Inter scum what true champions look like, a team that actually works for what they win. I want Leo to look into the eyes of even our biggest mercenaries, and remember what it is to be a Rossonero, tried and true, because even our rentals are more true Milan than him. Enough of the second rate team taking home the trophy, this year the Scudetto needs to go to a true champion team: A.C. Milan. And winning that trophy starts Saturday. Winner takes all.